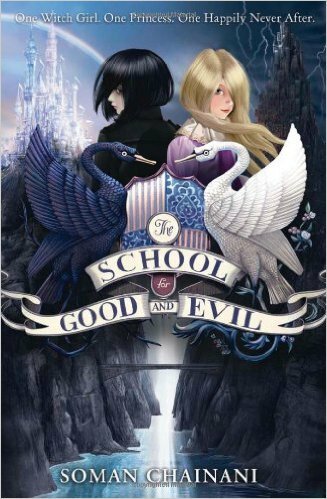 This book is called The School for Good and Evil by Soman Chainani. It is about Sophie, a girl who dreams of princes and princess’ galore, and her best friend Agatha. You can kinda tell by the name of Agatha that she likes the colour black and lives in a graveyard house. In fact, all that stuff is true! Every 4 years, a mysterious creature, known as the school master, comes to take 2 children, boys or girls, to a place called the school for good and evil. That is where our story begins. One night, Sophie was looking out of her window when she saw a shadow wisp across the village. “He’s here!” At once she sneaked out of her house and then it happened. He grabbed her. As Agatha was there at the time, she ran after Sophie. Despise all the clawing and scratching, Agatha grabbed onto Sophie and they got taken away, in to the land of good and evil. This book is about a mistake that happens to the 2 girls. Sophie, as you have probably guessed wants to go to the school for good. Agatha on the other hand, the school for evil. That’s the mistake, you see. It goes nothing to their plan. Romance, hate, good, evil, young, old, this story has it all. This book is highly reccomended. The genre is fantasy, by FAR!!! !